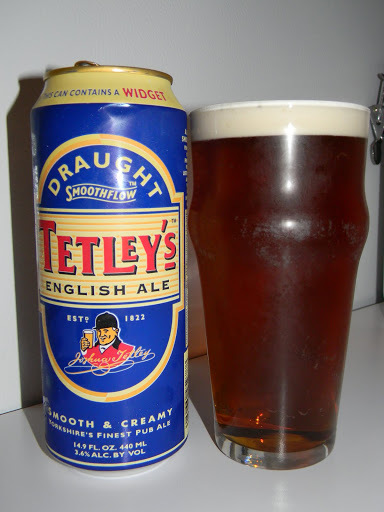 Review of Tetley’s English Ale | Beer Apprentice - Craft Beer News, Reviews, Interviews and Info. Are you guys ready for another craft beer review? I know I am. Today, I have a beer that I’m very eager to try. It’s the Tetley’s English Ale from Carlsberg-Tetly Brewing Ltd. in Leeds, United Kingdom. Now, from what I understand, this brewery closed its doors in June of this year (2011) and was moved to Northampton, so I was fortunate to be able to score a can from the “old” factory before it became too scarce. The original website is no longer operational, but I was able to find a commercial description of this beer from ratebeer.com. Nitro Keg Ale and Canned Widget Ale. An export strength beer brewed specifically for countries outside the UK. It has the same smooth and creamy characteristics as Tetley’s Smoothflow and incorporates a full drinking flavour. It is well balanced with a complex range of malty and hoppy notes, enhanced by a fruity aroma. Like Tetley’s Smoothflow, it is served at 8 degrees C to give extra refreshment. Let’s pour this nitro canned beer shall we? This beer came in a 14.9 oz. nitro widget can and had an ABV of 3.6%. Poured into a nonic glass this beer appeared a very attractive, clear, amber/copper to dark gold in color. Burnt orange highlights kissed the bottom of the glass. The crown was very tight, compact, smooth and very creamy looking. The egg shell colored head was none too large, but it had superb retention and left behind some super thick lacing. This beer looks good and very inviting. At first whiff, this brew smelled outstandingly creamy. A soft bready malt swirled along with a timid herbal fragrance. It was a bit sweet with aromas of faint lemon grass and melted butter. Underlying it all was a yeasty, grainy hint that, again, was subdued and relaxed. The aroma was nicely balanced, but it was considerably weak and temperate. The taste brought forth a very, very creamy to almost milky savor. A slight buttery note combined with a “graininess” and a doughy, yeasty personality. A touch of hops were detected, but they seemed to be very mild with no discernible bitterness. A calm, soft, malty sweetness gave the flavor a bit more disposition. Once again, exceptionally well balanced, yet constrained considerably. The mouthfeel was medium to medium/thin. Incredibly creamy and smooth. Mostly crisp, soft and feathery. It was completely refreshing on the hot day that I tried it. It’s a slight bit watery, which led to not much flavor being left behind on the palate. It faded pretty quick to be honest. Overall, this beer has an unbelievable ease of drinkability factor. I think I could “kill” several of these at one time and not think twice about it. This is a decent brew. It’s nothing outstanding or overly complicated, however it’s nothing horrible or obtrusive either. This seems like a “working man’s” type of beer. Just pop open a cold one and enjoy. It’s worth a try for the sheer creaminess of it. I’m sure you may still be able to find a can or two on the shelves, but who knows for how much longer and if the recipe is going to change? So don’t wait. If you see it, give it a try. It’s darn fun to drink!!! I might just have to pick this up again sometime myself. Thanks for reading and commenting everyone. Have a great day.